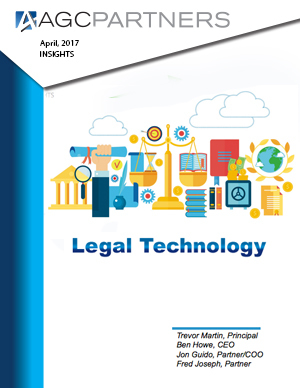 We are pleased to share with you our latest report on Legal Technology, a potentially ~$16 billion market with low penetration rates. Despite slow adoption, legal technology is finally at the cusp of accelerating growth and consolidation. After several years of furious start-up activity, resulting in more than 700 legal tech companies, the industry is primed for its first wave of consolidation and later stage growth financing. At the same time, the legal profession itself is playing catch-up to the IT adoption cycle blazed by the rest of the service-based industries, most notably the deployment of digital SMAC technologies (social, mobile, analytics and cloud) to achieve high productivity and a lower cost of delivery to the end market. In this report we will examine historical themes and future trends, how the major players and smaller disrupters are redefining the legal tech market, and what the future holds for the capital markets and M&A.